Snapchat is all about human relationships and human connection. It’s a way to align your brand through daily video communication with your community. Why use Snapchat for real estate? Documenting the daily behind-the-scenes of how you are helping your clients and showcasing your local expertise through video is powerful. Gary Vaynerchuk was the keynote speaker for ICSF16, and he urged every attendee to become a media company first and a real estate professional second. Real estate is a relationship business, and the most efficient and effective way to authentically communicate your personal brand message is through visual communication. People want to buy or sell a home with a trusted adviser, and real-time video is a trust accelerator. Tomorrow’s consumer is going to expect us to have our own television channels where we are the stars of the show. It’s not about ego or fame, it’s about showing people what we do without having to tell them. Audience: Where is the attention? Participation: How easy is it to engage? Authenticity: Are you connecting on a human level? Snapchat is fast and easy media creation on-the-go that leverages the power of visuals to connect on an authentic level with your community. It has the highest engagement of any other social platform with over 60 percent of users creating content every single day. The messaging capabilities allow users to communicate easily without needing someone else’s phone number or email. Snapchat gave us a broadcast network and editing studio in our pockets that allows us to share our stories with potential clients in real time. It gives viewers a chance to experience you in a real and unedited format, which is a much more intimate setting than a noisy feed. Getting to know someone every day, eye-to-eye, creates opportunities for relatability, and when we can relate to people, they become very relevant to us. What kind of content is working? Content that aligns with your brand is key — it should be educational, entertaining or inspiring and show how you are helping clients in your market. Snapchat is more of a personal channel, so be sure to show the “real you” and the behind the scenes of your day to day. Most importantly, because Snapchat is about human relationships and communication, it should not be all business all the time. Snapping an incredible dinner at your favorite local cafe is more personal and also showcases that you’re a fan of the neighborhood in which you live and that you know some of the best spots in the area. You don’t always have to talk about real estate to talk about real estate. With an ephemeral platform like Snapchat where the content will eventually disappear, it’s important to commit to creating content on a regular basis — it doesn’t have to be a ton of content, but a few daily snaps at least. The idea behind Snapchat is that it mimics human communication and only exists in the moment — our conversations happen in real time, and there’s no recording of that. Disappearing content means that people tune in because they don’t want to miss it! Staying consistent keeps your story in your viewer’s feed. Additionally, because there is no algorithm determining what content gets seen, the more regularly you share to your story, the more likely it is to be closer to the top of the feed. When you are first growing your community, engagement is critical (it’s always critical, but even more so when you’re starting out). Commenting on people’s stories will create conversation, and it’s almost a guarantee that the other person will reply. If possible, try to send either a voice message or at least a sentence rather than just an emoji — it shows that you took the time to create a conversation. My personal strategy was never to watch a story I couldn’t comment on. If that meant only three a day, then that was it. Engagement is the key to growth on Snapchat. Focusing on a target persona, one neighborhood or an area of expertise (senior living, condos, beach front homes, first-time homebuyers or veterans) can help you hone in your content strategy. Knowing who your audience is will make creating content easy because you know exactly what will appeal to that audience. In turn, being specific helps the audience know what they can expect from your content. Don’t worry, over time, you will be able to move into other niche areas once you master one and become known in that space. The saying “riches in the niches” couldn’t be more true — learning to master one small segment will help you get known for that one thing. Plain and simple, don’t get paralysis by analysis, just start making some content and doing it every day. Even if it’s only a few snaps a day and commenting on a couple of stories, get into a rhythm and get comfortable with the idea of talking to your phone. Make sure that you are looking directly into the camera at the top of your phone, not at your own eyes in the screen — this makes it appear that you are looking directly eye-to-eye with the viewer, which equals trust and authenticity. Don’t make it all business; have some fun, and show the real you! Face lenses are fun, but use them under the right circumstances. Trying to deliver educational content in a high-pitched bunny voice over multiple snaps starts to erode that level of authenticity you are working to build. Maximize your content, and give it some context by adding additional information or data over your snap by using the text feature. Instead of making more snaps to communicate your thoughts, speak your thoughts and add in some text that reinforces or expands on that idea. Remember, we’re communicating in micro-moments and snippets, which means a long story may lose attention. 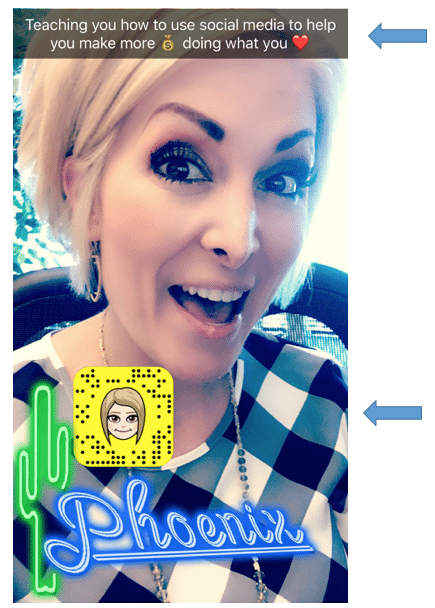 Use the creative features such as drawing and stickers, but again, don’t overuse them on every snap because we want to talk with a real person not an over-animated character; after a while, you’ll get comfortable with just being you on camera (I promise!). It may be helpful to start out with a content calendar or a weekday theme to get your creative juices flowing. And if you prefer a little more structure, jotting down some bullet points will help you stay on track with your content ideas. Write down a list of every question you’ve ever received working with a client, and keep a notepad with you on showings, there’s tons of content that can arise from those adventures! If you like to “wing it,” simply remind yourself that when you are out and about showing homes, working in the office or enjoying the area that you serve, take out your phone out and snap. Encourage engagement by asking your audience questions; for example, ask viewers how much they think your new listing is going to be priced at. Play games with your audience; ask them to send you a snap with their local geofilter, and feature that on your own story. There are endless themes you could use like #ThankfulThursday or #WhereYouFromWednesday. Note: Games are fun to participate in, but don’t feel as though you have to rely only on games to increase engagement — asking questions and talking to people will naturally increase your engagement! Show out-of-state clients homes using Snapchat videos. Check in on clients with video for a more personal touch. Give sneak peek previews of homes not yet on the market. You might even ask your audience to guess the price for more engagement. Share links or previews of your exclusive content like a new blog post. Showcase the local businesses in your farm area, and talk about why you love them. Behind the scenes of preparing a listing for sale. Showcase how you create your marketing plan for listings. Teach a new topic of the day or week, for example, FHA loans, homebuying process. One of the most exciting feature rollouts just occurred in July of this year — the ability to add links to your snaps. Before, only paid advertisers were able to add links to their snap content. 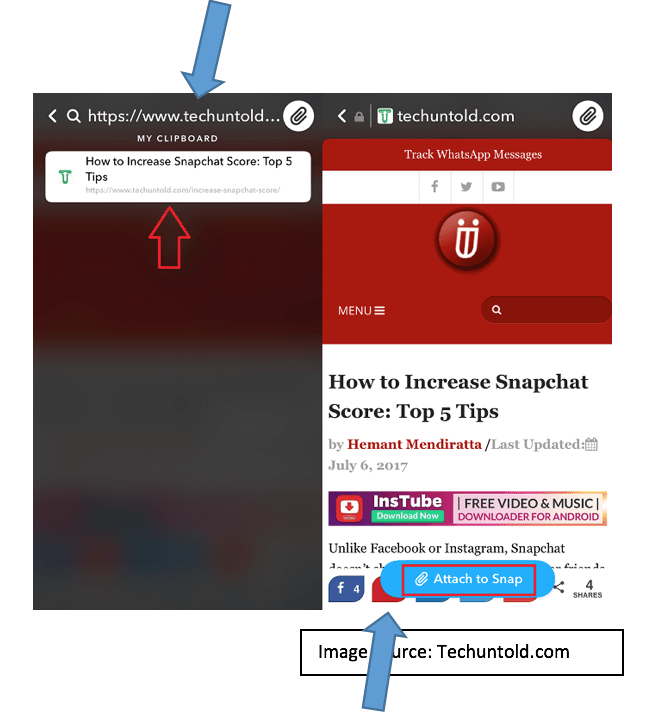 Now, if you have an amazingly valuable piece of content on your blog, you can include a call to action in your snap telling them to swipe up and click on the link included to access that content. Once the snap is created, the editing options will appear on along the right-hand side of the screen. Tap on the paperclip icon. Type in a URL in the box, or if you have already copied a URL, go ahead and paste that into this box. Don’t forget a verbal or text call to action letting your viewers know what to do and why they want to access your valuable content. Use trackable links like Bit.ly to track where your click traffic is coming from. Snapchat was designed for users to connect intentionally with others to grow relationships and communities. By design, it limited discoverability, which means it’s tough to find people unless you know their exact username or have their Snapcode. Add your contacts from your phone. Add your Snapchat username to all social profiles/bios. Use your code on all of your marketing collateral, website and business cards. Check out third-party Snapchatter directories like Ghostcodes.com and Snapdex.com. Join Facebook groups about Snapchat, and add those people. Send an email to your database about your plan to share stories and behind-the -scenes content on Snapchat along with your username and Snapcode. Add a Snapchat link to your website. Ask every client you meet if they are on Snapchat; ask anyone you meet! Takeovers. This is where two Snapchatters swap accounts for a few hours up to an entire day to increase their exposure to a new network of people. A takeover does require allowing another user to log in to your account. Note: Many active Snapchatters understand that it’s difficult to find new people to connect with, which is why you will see “shout outs” where a snapper shares someone’s username or Snapcode on their story. This is one of the best ways to find new folks, so if you love watching someone, share his or her code and why you love the channel with your community! Press, and hold down on the person’s name or story. Once their Snapcode pops up, take a screenshot. A pop-up box will appear at the top that says “Edit Screenshot” — tap it. Using the scissors tool on the right-hand side of the screen, trace around the Snapcode. Now, you can close out of this screen by tapping the “X” in the top-left corner, and the Snapcode will be saved as a sticker for future use. 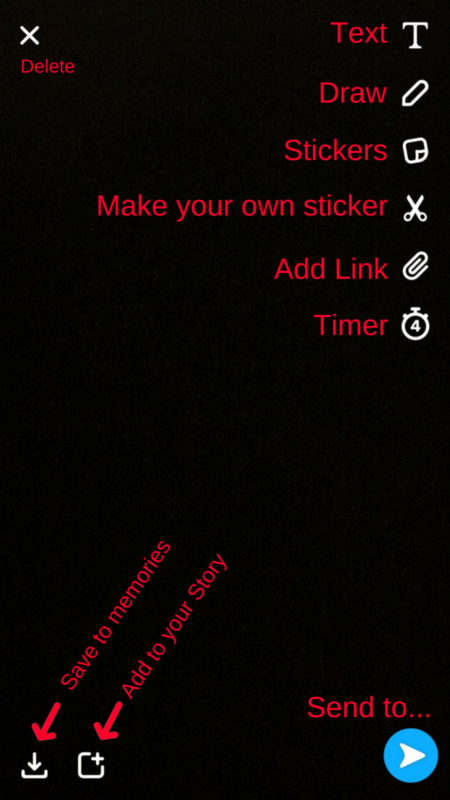 Create a snap telling users why they should connect, and add the sticker onto your snap by tapping on the sticker button. 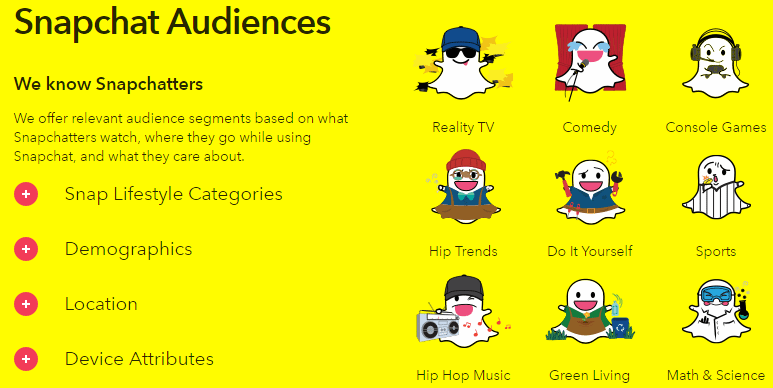 Snapchat is able to identify verbal keywords, text keywords and images. If you want to be found in these stories, you can create a snap and place the keyword on your snap along with your Snapcode. If you don’t add your username or code, people won’t be able to add you from viewing the local stories. Note: Snapchat is currently amassing a searchable keyword “library,” which means not every keyword is findable yet, so you may want to use more broad terms. Access the local stories section by opening the home screen and tapping in the search bar at the top of the screen. 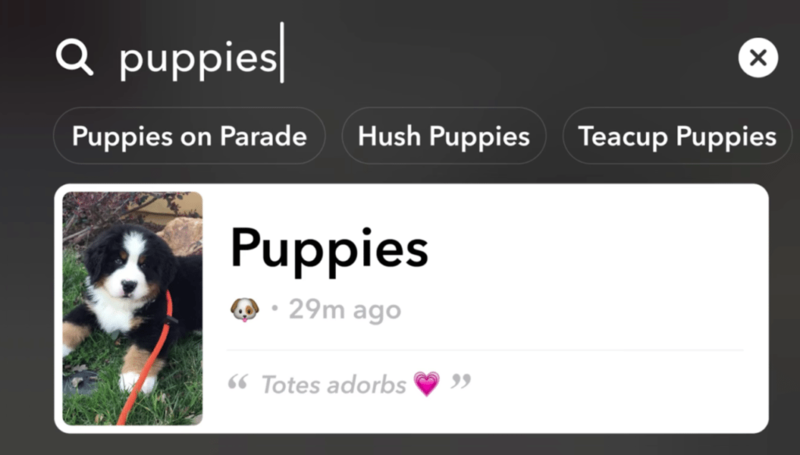 Once you have submitted your Snap with the keyword of your choice to “Our Story,” you are likely to find it by searching that word in the search bar. Snap Map is a map of the world that was designed to help you find current friends, meet new ones and see global stories. “With the Snap Map, you can view Snaps of sporting events, celebrations, breaking news and more from all across the world. If you and a friend follow one another, you can share your locations with each other so you can see where they’re at and what’s going on around them! Plus, meeting up can be a cinch.” – Snap, Inc. Pinch two fingers together on the screen (as if you’re trying to make an image smaller). 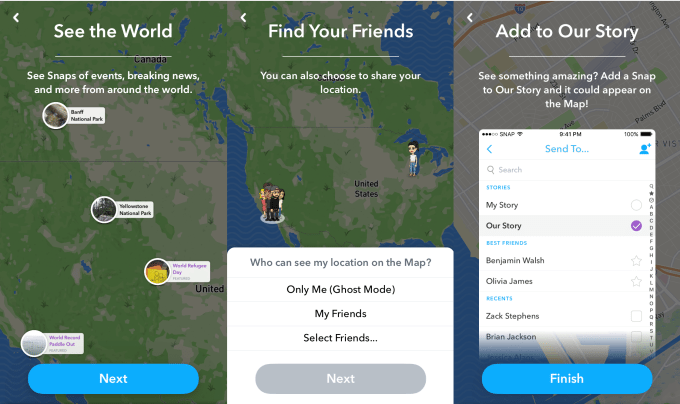 The Snap Map will automatically appear, and you can tap on friends or local stories — you can also add new people you don’t already know by tapping on their Bitmoji. Safety note: If you are alone in an open house, please consider turning off your Snap Map location (if it’s on), and be cautious of snapping content that shows you are alone and including your exact location. There are three levels of advertising within Snapchat: sponsored lenses, sponsored geofilters and Snap Ads. We will focus on geofilters as these are the most accessible and economical for the everyday user as well as preview of what’s in store for Snap Ads. A geofilter is simply a digital “sticker” that is overlaid on top of your snap. 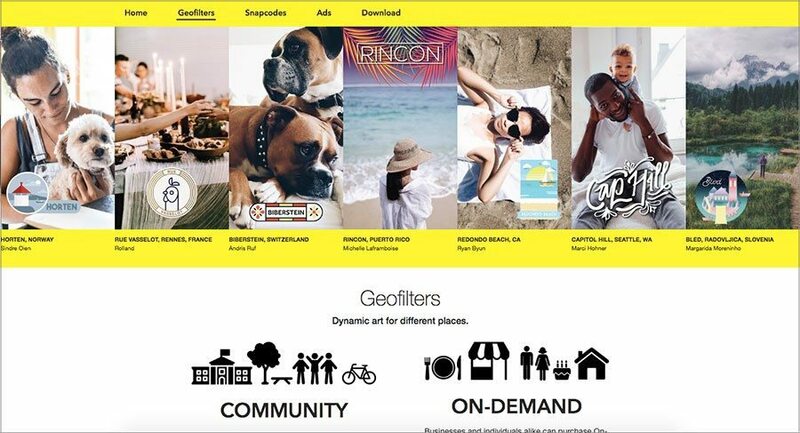 Snapchat uses the geolocation data from your phone to serve up a variety of daily filters that are hyperlocal to your current location. Geofilters can help you grow your brand awareness in a fun and interactive way because they are less invasive than traditional advertisements and allow the user to engage with the content on their terms. As of June 27, Snapchat allows you to design your own geofilter right from the settings section of the app. Select template, location, time and date. 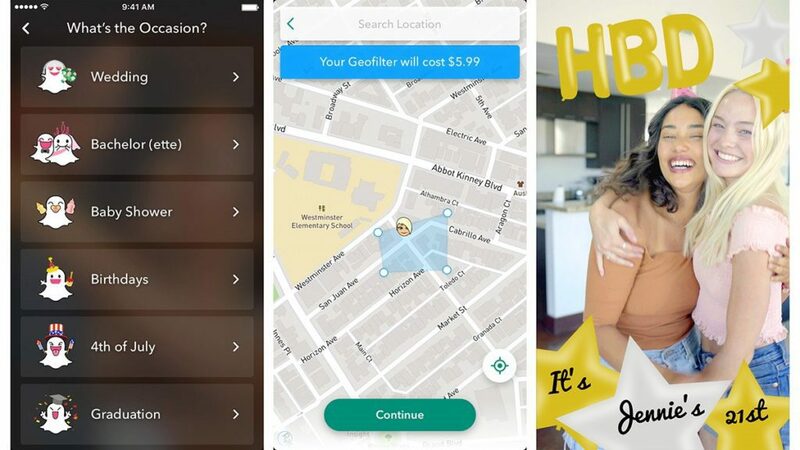 After you have made your payment, Snapchat will review your geofilter, which takes less than 24 hours normally. Note: Pricing will vary depending on a geofence area, length of time for filter to be live and other large events taking place in that area where advertisers may already be using filters. Snapchat offers hundreds of pre-designed templates that allow customization such as color scheme, text overlay and the ability to upload you and your friends’ Bitmoji! If you prefer to work on the desktop or if you have created your own filter in another design platform, this may be the ideal design method. Design: Navigate to the geofilter tab on Snapchat.com, and select the theme for your filter. Select a template, or upload your custom design (if you design your own, be sure that the file you upload is a PNG with transparent background). 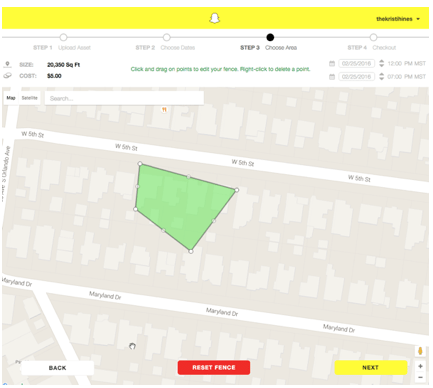 Map: Select an area based on an address or area, and draw a “geofence” of that location, select the dates and times you want the geofilter to be available. Buy: Submit the finished design for approval to Snapchat team (normally approved in less than 24 hours). Log into the desktop version of Canva, and create your own geofilter from scratch by clicking on “custom dimensions” button and entering in 1080-by-1920. This option would be ideal for anyone who wants to create a 100 percent original design without a template. Note: If you use Canva to make a geofilter, you will need to the paid version to export the image in transparent PNG format. The Canva app also offers Snapchat geofilter templates as well. Don’t over-brand the design. Keep in mind that the design needs to be one that people will want to use. It’s about their photos so if the filter is all about you and your brand, they may not be as excited to use it. Be careful not to cover up large portions of the screen with your designs; remember it’s not about you, it’s about the user’s images. Be aware of colors, and make sure the design will show if placed over a variety of backgrounds. Typically, using text in your design is much easier to see if you place it on a solid background. Often, using text on the bottom half of the filter can get lost when a photo is behind it without a solid background. You cannot use hashtags, URLs or @usernames, however, you can use logos and taglines. Don’t wait until the last minute, Snapchat only allows a certain number of filters to run in the same location at the same time. Also, give yourself enough time for the approval process, especially if you’re filter is denied, so you will have time to redesign. The approval process has fairly quick turn times, but it’s not a guarantee that it will be less than 24 hours. 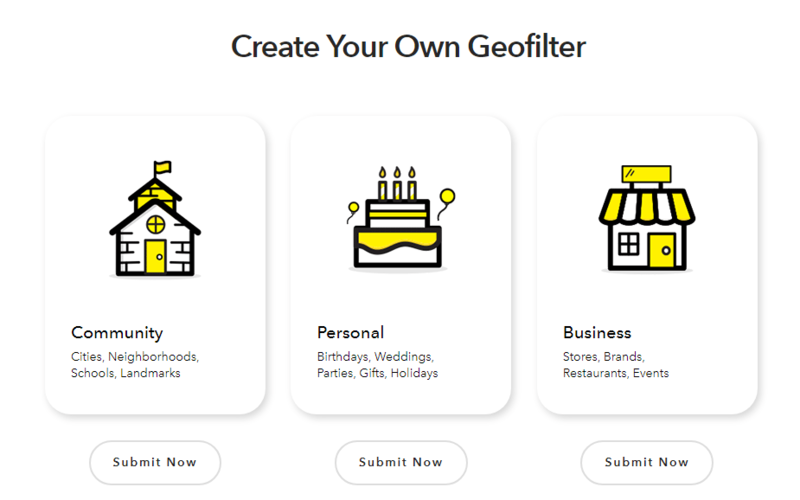 Notes: Geofilter costs vary based on the length of time or days you want the filter to run and the size of the area the filter will cover — it could be as low as $5 and as high as in the thousands. Additionally, if you’re thinking about tapping into a huge event like the Olympics, think again; Snapchat already makes advertising deals with big brands during major events and will either raise prices to extremely high levels or only offer those geolocation areas to major brands. Snapchat also offers annual geofilter options, which means that you pay a pre-determined price that auto renews each year (prices may adjust). An annual filter could come in handy if you want to continually have a custom filter for your brokerage at all times over the office location. 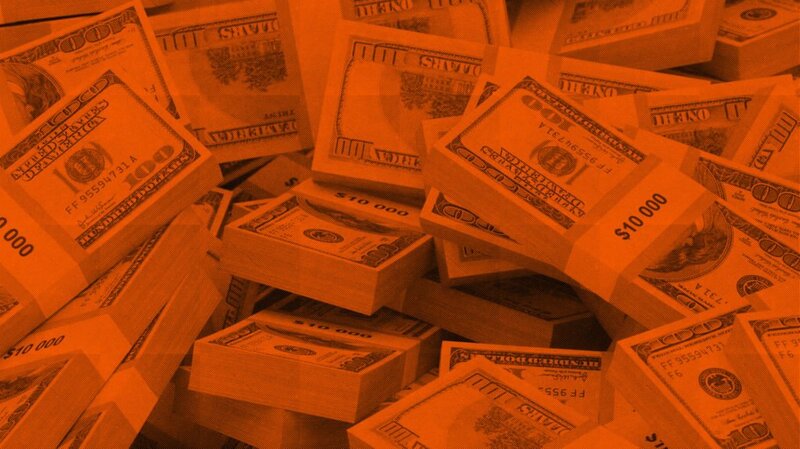 Ultimately, it could save you money in the long run, and it offers you guaranteed exposure in a specified area long term. Open house: Snap a photo contest. Scavenger hunts: Great for mega open houses or neighborhoods with multiple opens. Local events: High school or college game day or local food and arts festivals are great fodder. Conferences and trade show booths: Showcase the happenings. Over your brokerage office: Encourage agents to share their daily fun (great for recruiting and exposure for your culture). Get your clients involved: Have a “design my Geofilter content,” and crowdsource ideas, allow people to submit original designs and showcase the winner. Snapchat recently announced the rollout of its self-serve ad platform that features an online dashboard similar to Facebook’s Ads Manager where you can create your own ads. Ad creation will be accessed at Snapchat.com. Snapchat will also be launching a mobile dashboard to allow campaign tracking from your phone and a business manager that allows team members to be added with permission levels and multiple account management. All Snap Ads are made for mobile; they begin with up to a 10-second vertical video and then offer the option to add additional interactive elements accessible with one swipe up. 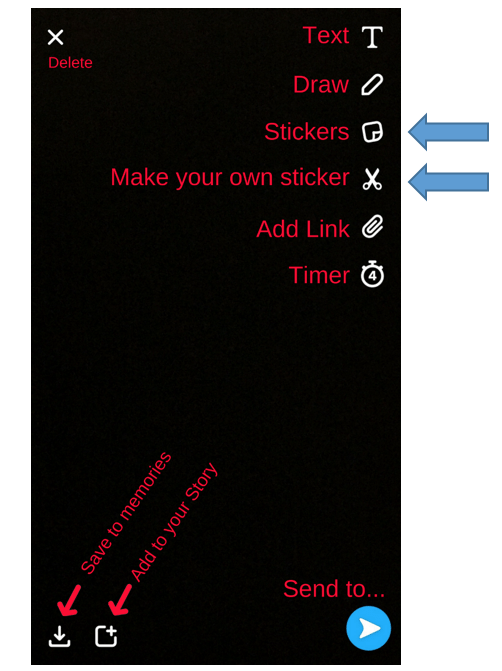 Snap Ad + Article: Swipe up to read the article that can include text, videos that autoplay, GIFs, images and galleries. Snap Ad + App Install: Swipe up to access embedded App Store or Google Play Store page to begin the installation process. Snap Ad + Long-Form Video: Swipe up to watch full length trailers, short films, tutorials and more. Snap Ad + Web View: Swipe up to connect directly within the app to target website. What metrics will be available? Can I create and target audiences? Like Facebook Ads, Snap Ads will offer targeting based on user behaviors and demographics. 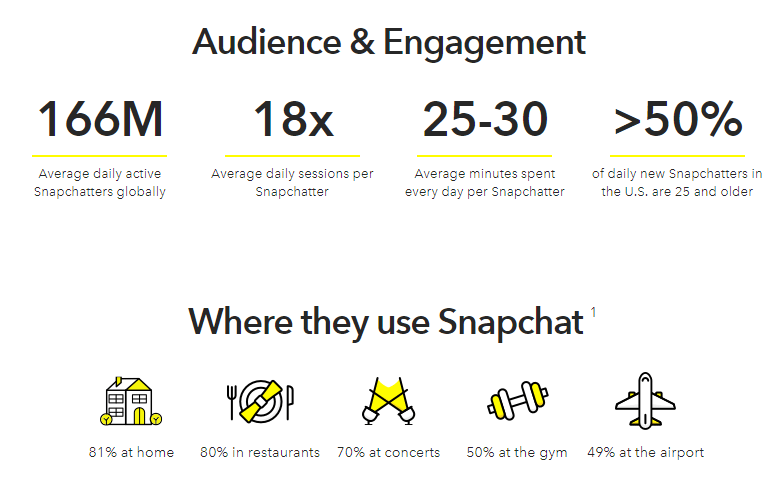 Snapchat will allow advertisers to use its data to create new audiences and also allow users to match emails, create lookalike audiences and connect with people who have engaged with your Snap Ads, geofilters or lenses in past campaigns. 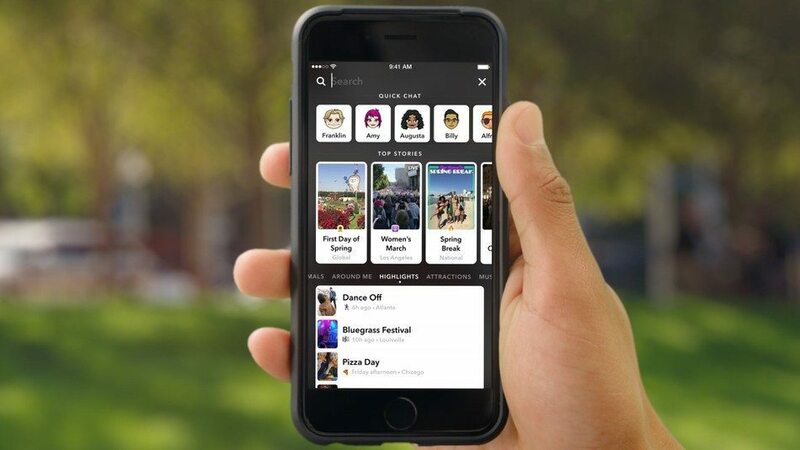 Lastly, Snapchat works with third-party partners such as Oracle and PlaceIQ that can tap into offline purchase behaviors, movie viewership and even locations that Snapchatters have visited throughout their day! At the publishing of this article, Snap Ads aren’t available to all users. Although I’ve not personally created one yet, I can tell you that as an avid Snapchatter, advertisers are going to have to step up their game in this platform that requires creative, fun and eye-catching ad content. The static logo image just won’t do. If you missed the first part of this ultimate guide, check it out here.